Here’s a project I completed a couple of months ago for my Mom as we anticipated warmer weather. Her outdoor swing under the pine tree was on it’s last leg and needed to be replaced. 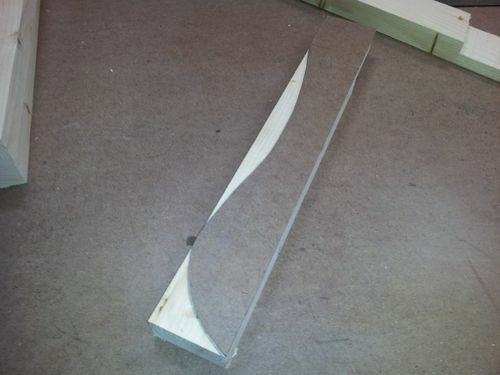 The project was pieced together from pictures on the internet and it was my first effort at half lap joints and curves. I don’t have a picture of the finish that was applied but I went with several coats of high gloss poly and I was pretty pleased with the outcome. Now the wife wants one and an arbor to hang it from to boot! I’m on it! Very nice project. It not only looks realty good but it looks well built and durable. Your mom will have many enjoyable hours in that swing. Really well thought out and beautifully constructed! I’m going to make something similar for my wife except that it will be a glider. Now I am inspired to get going!!! My plans call for the slats to run vertical, but I really like how your horizontal looks, hmmmm…. That is one great looking project! Very nice and looks sturdy. What are the dimensions? I am finishing up a redo of my porch ceiling and included eye bolts for just such a swing. I was going to go with just a single support in the middle for a 4’ wide bench but this looks better. This is a really nice project and will give people a lot of restful pleasure over the years. ja6ke - I didn’t work from any plans but if my memory serves, the overall length is 55”, the seat section is approximately 24-26” deep. The half lap joints were cut at 15 degrees to “tilt” the back. Very nice!. Now my wife wants one! How long before I can expect delivery LOL! Very nice build Dennie. I like the contour of it. Looks comfy.